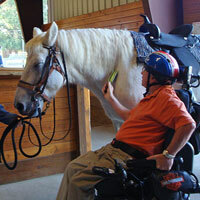 Our mission: to offer the miraculous benefits of therapeutic horseback riding to persons of all ages and capabilities that are physically, mentally or emotionally challenged. Serving the heart of Florida since 1985, Marion Therapeutic Riding Association (MTRA) is a PATH Premier Accredited organization. MTRA provides therapeutic horseback riding or Equine Assisted Therapy sessions at a very minimal cost or on a sliding scale for those who cannot afford our very reasonable fees. The program income provides only 10-15% of the funding needed annually to keep our services in place and to cover the very high costs of feeding and maintaining horses, maintaining our PATH Premiere certified facility, overhead costs such as insurance, staff and certified PATH instructors. Therefore, we rely heavily on the generosity of the community and its businesses and corporations through donations, grants and other funding. In addition to the expense of our services provided at our Greenway location, for over 30 years we have maintained the equine therapy program at the Hillcrest School for exceptional children, without charging the students and with no funding assistance from the school district.Located in the heart of the Horse Capital of the World™, beautiful and temperate Ocala, Florida, we strive to put the spotlight on these wonderful animals who keep our thriving community together. If you have questions about our program, please email our Executive Director, or call our offices Tuesday through Saturday at 352-732-7300. MTRA is located on Florida Greenway land and our facility was originally built with a Community Block Grant from Marion County. We are thankful for the state and our community for providing us with a beautiful and safe place to nurture our clients. To learn more about the Florida Greenway, please click on the logo at right to visit their website.